ImaginOn has launched a new space for preteens, so if you are between the ages of 7 and 11, this is the space for you! The Block, located in the back area of Spangler library, is a special space reserved just for tweens (no younger siblings allowed! ), with LEGO tables, self-directed activities, and regularly scheduled programming. All activities in the Block are completely free and open to children ages 7-11. 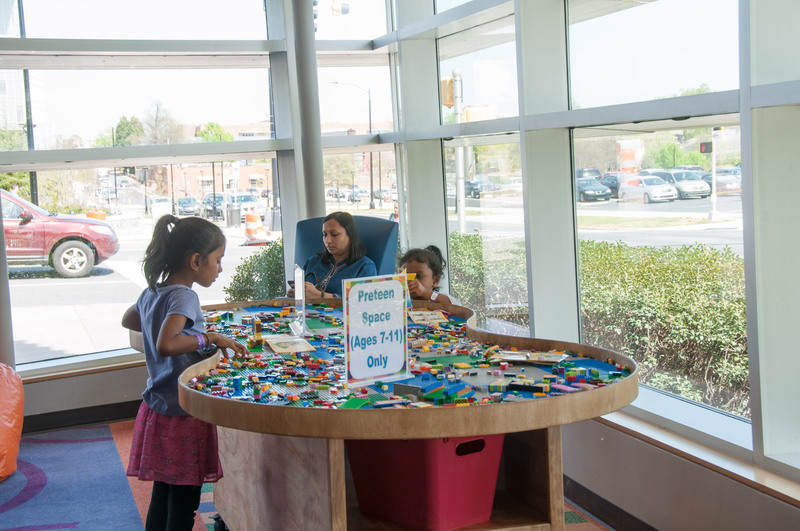 Complete the weekly LEGO challenge on our flip-top tables and get your picture featured in our LEGO Legends reel. Join us for Learn, Connect, Play: WiiU Gaming at 3pm on Saturdays and Sundays during the school year and Mondays through Fridays during the summer, and compete with your buddies on games like Just Dance 4 and MarioKart. Join our regularly scheduled pop-up programming at 2pm to participate in anything from Play-Doh challenges and origami programs to learning how to use our Ready Animator and MakerSchool kits (which include activities like fiber arts, marble run challenges, erector sets, etc.). On Fridays at 3pm during the school year, join us for Kickback in the Block to watch movies and eat popcorn or compete to win a prize in our Championship Challenge series. Or, any time of the year, just grab one of our bean bag chairs and a good book or graphic novel and relax and enjoy your special preteen space!